My teenage and college years offered me an active musical learning experience with exposure to various traditions in the arts. At this time, there was an increasing awareness among the younger generation to share their cultural identity, realized through student organizations and cultural festivals. Alongside the established organizations for art in Chennai, the younger generation took interest in performing traditional arts. In this backdrop, I learnt compositions of various composers and especially those of Sri Mysore Vasudevachar under whom my mother apprenticed. Though I had other interests, by chance I pursued arts for my undergraduate and graduate degrees; it was one of the best decisions I ever made. I began to enjoy the historical, textual, and practical side of music. My natural affinity for the arts led me to explore formal education in music in the light of literary works such as Kamba Ramayanam and Indian philosophy. This time period of the late 1970s and early 80s also saw growth in the popularity of television, which brought in a sharp cultural shift. The television medium provided easy access to entertainment and heightened noise pollution, drowning the natural harmony and subtleties of the more traditional arts. The concert halls now reverberated with hyper-amplified performers and electrified Tamburas and Veenas. In my mind, the struggle had begun, as I was not able to enjoy the natural tonal qualities of the instruments. The tug between idealism and pragmatism was a polarizing experience and stayed with me for a long time. The changing musical tapestry coupled with the internal struggle led to a rebellious spirit: to carry the tradition with authenticity wherever it would flourish. Many memorable concerts with my mother come to my mind for their subtle acoustics from the Veena and voice, giving an ethereal experience. Having newly married in the late eighties, I arrived at Houston, Texas, accompanying my husband. As with most immigrants coming from a developing to a developed nation, the shift in location was a journey of comparisons and contrasts. The transition from a world of art to a culture of entertainment and technology raised questions of whether I could continue what I believed to be a world of wonder and excitement. I often pondered about the scholars who visited my mother country and their experiences in a new environment. Perhaps I had the same concerns. I began to grow into my new environment through the language most natural and familiar to me: music. I eagerly listened to all genres including gospels, a capella, symphonies, soft rock, and country music. These experiences led to the realization that my identity was deeply rooted in the subtleties of music; making the connections to the land, the sounds, and the culture were important to my survival as an artist. The egalitarian nature of my family background in sharing music needed patronage. By the time I entered the field of art, the kings and wealthy elites who supported the previous generations no longer existed; instead, the support infrastructure for art became the responsibility of the common man. As a result, arts and academics separated into different parts of the day that best suited the common man. Every genre of Indian music had a particular time and space, and within that realm existed the identities of the members in that community. The ubiquitous nature of the family’s practice of art was in contrast to the challenges posed by the current times. I slowly began to search for an Indian community and its surrounding cultural activity. Since I had never searched for anything, much less a community, I was intrigued by my new status in a society that I seldom knew or imagined. Under these circumstances, one day, my husband and I were invited to a house concert of South Indian music. With great expectations and a longing to meet people, we arrived at the house only to be surprised by the affluence of the community and its penchant for association to the arts and culture of its origin. The concert was performed by a young woman with accompaniments for a small audience. I quietly slid into the last row to listen, and throughout the performance kept the taalam with rapt attention. The program began with grand fanfare of Viriboni, an ata tala varnam, and proceeded with the orderly paraphernalia of compositions. I was pleased with the performance and felt happy to know that there was a place for Indian classical arts in a foreign land. Toward the end of the program, there were audience requests for popular compositions, to which the artists often obliged. To my surprise and shock, one of the requests was a song from the 1980 Indian film Qurbani, to which the audience responded with broad smiles and a sigh of relief that the lighter moments of the evening were unfolding. Suddenly, I was transported into the space of a Bollywood scene, and the ambience transformed to accommodate the young audience. I began to get a glimpse of cultural anthropology and ethnomusicology at play. At a different level, this experience also prepared me to question the purpose of my journey and how I was going to carry on. It was imperative I braced myself to find a way to carry the tradition while transporting the audience through a time travel. Stay tuned for the third part in this article series, which explores further developments in the western hemisphere. As a tenth generation member of the Karaikudi Veena tradition, my journey into the world of music began long before I was able to understand the demarcation between language and music. 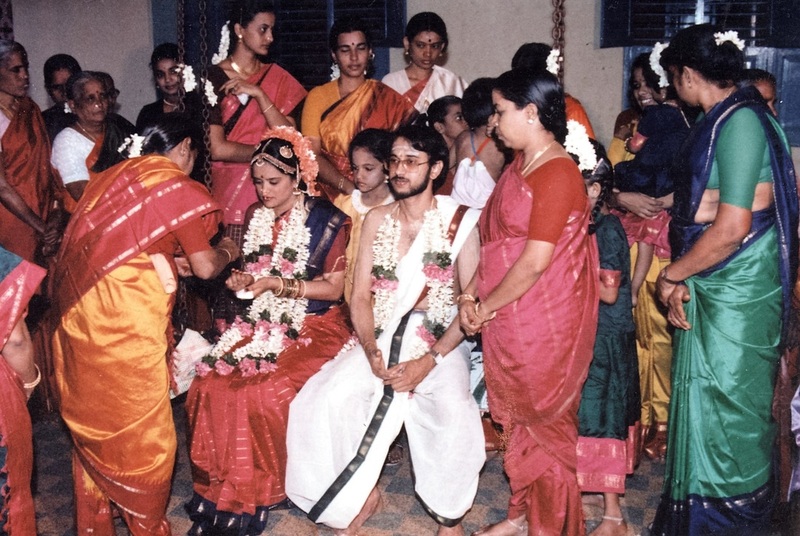 By the time I was born, my parents had moved from the quiet environment of Kalakshetra to a bustling neighborhood of Madras (later named as Chennai) to accommodate a growing family. Due to the change, my mother began to expand her pursuit with her faith in, and support from my father and his family. The daily routines of a Chennai city dweller began with hawking vegetable vendors walking the streets and loud speakers which broadcast a plethora of popular movie music. This conglomeration of noise combined with the subtle nature of the traditional music within the family. Each day began with my mother waking up to prepare breakfast in the kitchen. The clamoring and ringing of vessels gave a hint of the sruti (pitch) that we would sing in. In tandem with the musical vessels, the rhythmic beat of the maid servant washing clothes would regulate the tempo of a composition that my mother sang gently. Thus began the continuation of Gurukulam in a city far from the tradition’s place of origination. 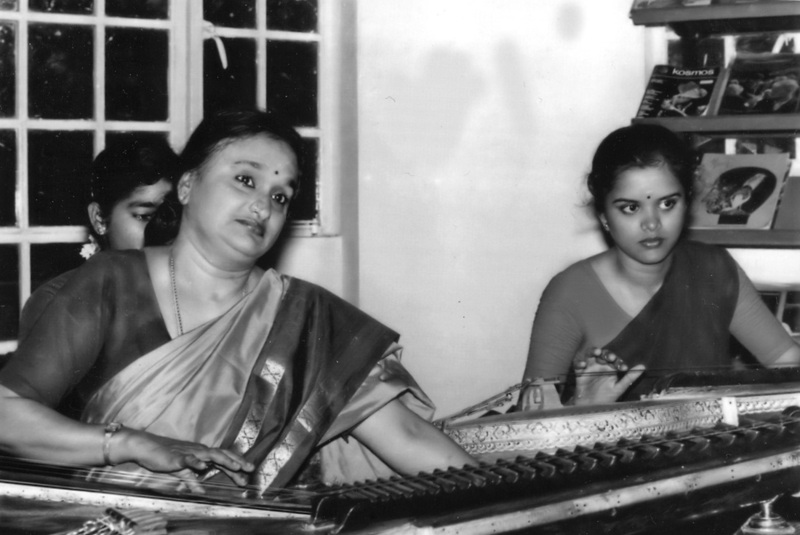 The musical journey with my mother Rajeswari Padmanabhan was a gentle and euphoric experience with days of music, but sparse conversation. The sweetness of her voice gave comfort to the daily demands at school and work. Because of the intense engagement at home, we didn’t feel the necessity for entertainment or activities. We were always surrounded by other students throughout the day. This provided opportunities for me to sit with students of different ages to learn (and grab my mother’s attention). Every conversation seemed to soak in better with some music around it. As much as I learned the call and response mode through music, there were times I was reprimanded through music for being mischievous. As an example, I had to sing a line of ​the ​pallavi, “innimel chonna padi kekkaren kekkaran” (Hereafter I will listen, I will listen) in three speeds with the rhythm in my hand. As much as these phrases left indelible reminders of the right conduct, they were also fun. 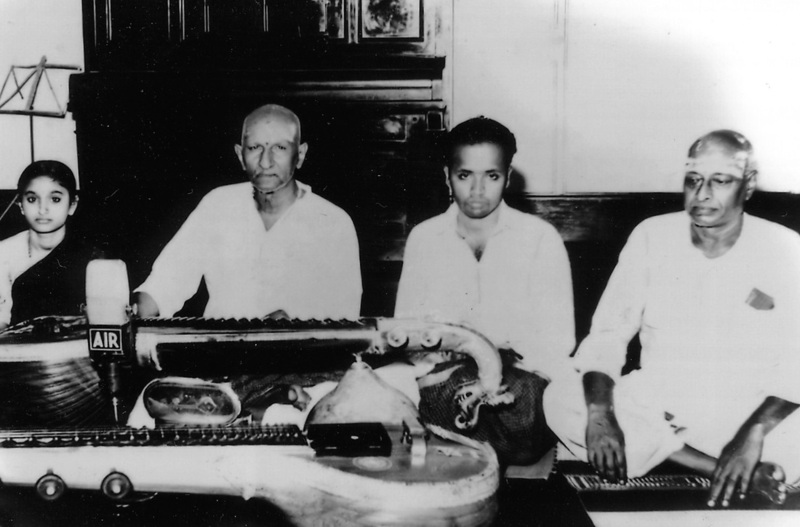 Many times my brothers and I fell asleep with our ears close to the resonator of the Veena as our mother was teaching. It transported us to a distant land that was sheer magic. By constant observation and self-correction that came with learning an art, I was able to develop my musical and physical character. As much as I was told the importance of discipline in practice and its place in our tradition, I was never forced to practice on a daily basis. If I embarked on practice, it was through self-propulsion, experimentation, and perseverance, similar to my forefathers’ extensive practice, which depended on their personalities and circumstances. My mother did not insist on performance; however, when I was five years old, I took the initiative to play the Veena in my school annual day. This experience, I believe, foreshadowed my pursuit in the arts. There was never a moment that was dull or overactive as the engagement was constant and exciting. At times, later in the evening, I could hear the sounds of music even after the students had long gone and there was silence. 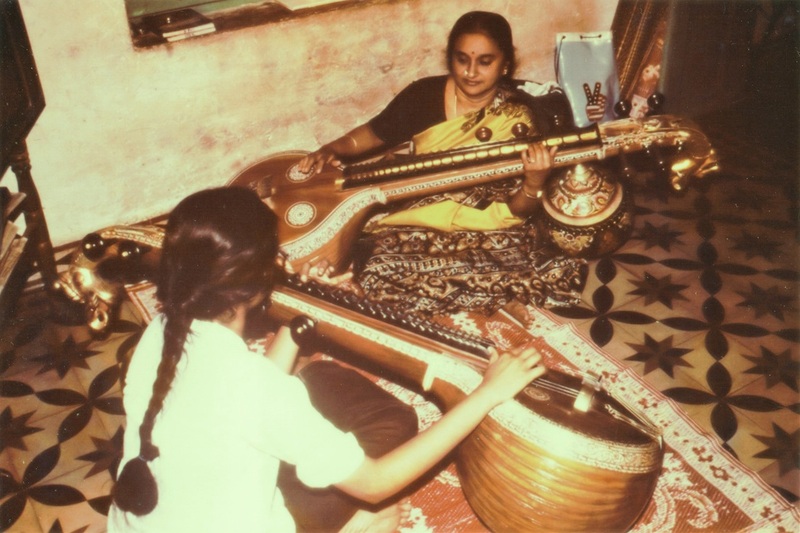 During vacations to my grandmother’s town of Madurai or her visit to Chennai, I would accompany her ephemeral voice on the Veena as she would lie for an afternoon nap or under candlelight after dinner. 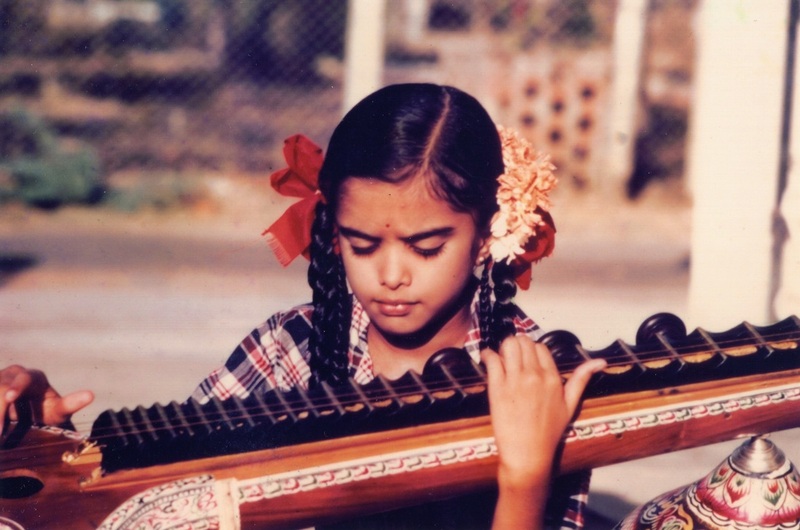 From the age of nine, I began playing Veena with my mother at times, and sometimes on the Tambura. During these breaks, I accompanied my mother to Kalakshetra to experience traditional music and dance in the quiet setting by the sea. The rustling leaves and the constant drone of the beach waves were serene, away from the hustle and bustle of the city. This rich exposure to a plethora of arts and tradition began to shape and guide me in pursuing art degrees later in my life. Apart from learning from my mother, during my early thirties, I pursued learning vocal under Sri Vairamangalam Lakshmi Narayanan and water color painting under Sri S. Rajam. The many afternoon conversations with these luminaries brought subtle experiences which challenged my skills and reinforced the tremendous power of oral traditions. The intensity of these experiences unveiled so many unspoken words and emotions I bequeathed and still cherish. My mother taught a wide caliber of students based on their interest and commitment. The wide socioeconomic backgrounds of the students never mattered once my mother sat down to teach. The incredible patience to teach any student was a hallmark of both my mother and grandmother Lakshmi Ammal. The city life and the influence of institutional teaching and schooling brought different dynamics than my mother’s training under Sri Sambasiva Iyer, challenging the Gurukulam teaching system that once thrived under the pre-colonial era. However, the responsibility to preserve and transmit the tradition to the next generation necessitated evolution and adaptation. Paving the way for the continuation of the tradition into the eleventh generation caused the family to accommodate and embrace the evolving technologies; the launderer’s rhythmic scrubbing was replaced by the pulsating humming of the washing machine, and the pitch of the ‘sruti box’ replaced the Tambura. As the tradition makes its way into the 21st century and in the Western Hemisphere, I strive to incorporate the rich experiences of my childhood into my classrooms. I am fortunate to carry the honor of continuing a tradition beyond the Indian subcontinent through my endeavors. I believe that integrating art into our daily lives inculcates peace and stability within the self and community.